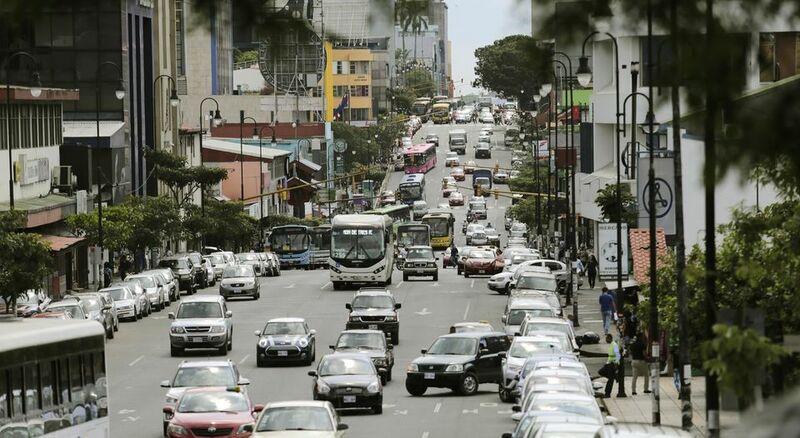 In an effort to find ways to curb the traffic congestion nightmare lived daily in San Jose, the Ministerio de Transportes (MOPT), on Friday, from 5:00am to 8:00pm, two of the five lanes of Avenida 2 will be for the exclusive use of buses and taxis. The day Friday was chosen to celebrate World Car Free Day, a worldwide event that aims to take the heat off the planet for just one day by encouraging people to be less dependent on their cars and try alternatives. A total of ten police officials (five from the Policia de Transito and five from the Policia Municipal de San Jose) will be on hand to ensure non-public transport drivers do not use the two right lanes of the Avenida 2. In reality, only one lane of traffic will be affected since the right lane has almost always been used by buses for boarding and unloading passengers and where all the bus stops are located. Unofficially, anyone driving the Avenida 2 knows it is for buses. The exclusive lanes will run from the Parque Mercedes on the west to the Caja Costarricense de Seguro Social (CCSS) on the east. Signs and cones will be placed to guide drivers. The deputy minister of Transport, Liza Castillo, explained that officials, in addition to monitoring traffic, will evaluate the results of Friday’s traffic movement with the possibility of making it a permanent plan. The measure will affect some 43,000 vehicles that transit the Avenida 2 daily and the thousands of users of public transport. In addition, the Instituto Costarricense de Ferrocarriles (Incofer) announced 21 additional trips on the urban train on all routes on Friday. The urban train moves on three routes: Alajuela – Heredia – San Jose; Cartago – San Jose; and Belen – Pavas – San Jose. Previous articleAustralia prime minister says 50 refugees will soon go to U.S.